There are many foods which I disliked as a child, but have learned to love as an adult. Brussel sprouts come first and foremost to mind. However, there is also a short list of foods which I have never outgrown my distaste for, and apparently rhubarb is one of them. 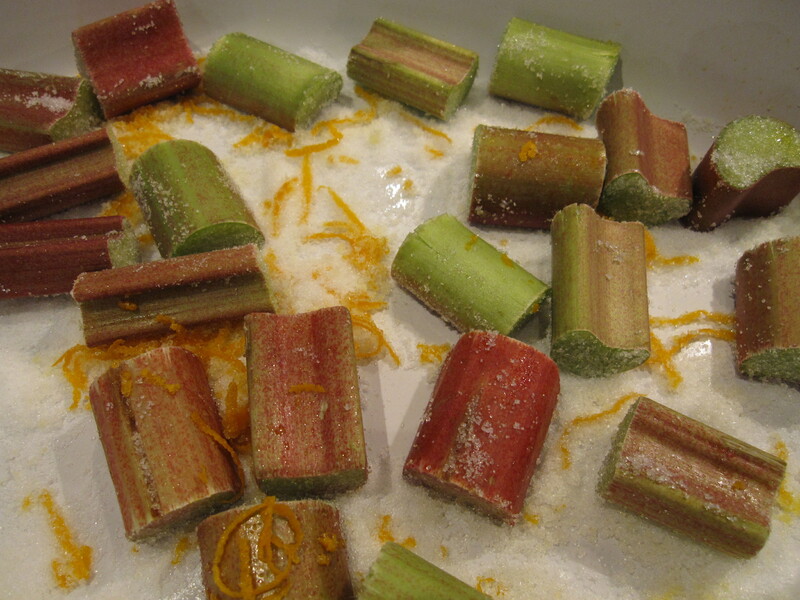 Until tackling this week’s French Fridays with Dorie recipe, I had not eaten rhubarb in a very long time. My mother, a formidable pie maker, used to make strawberry rhubarb pies when I was a kid, and it was pretty much the only of her pie creations which I was not a fan of. I considered skipping this week altogether, but I think it’s important to revisit our food dislikes every once in a while because, as with brussel sprouts, tastes change! And besides, this recipe looked so ridiculously easy, I had some homemade strawberry ice cream in the freezer which I thought would make a nice pairing, so why not give it a go? Final verdict? This recipe is ridiculously easy and I suspect that it is probably a very good one for those who do enjoy rhubarb. But, for now at least, rhubarb remains firmly on my short list of foods which I do not care for. Edited to add: Well, after some discussion with the other FFwD cooks, it looks like my recipe simply may not have been done correctly. It could be that I needed to leave my rhubarb longer in the oven or it could be that my rhubarb was simply too old and dry to produce the juicy result which everyone else seems to have gotten. According to my local market and the eat the seasons website, prime rhubarb season around these parts is February to May. Maybe I need to give it a try again next year because the photos from the other FFwDers are looking mighty good! This entry was posted in french fridays with dorie and tagged Around my French Table, dessert, seasonal - spring. Bookmark the permalink. 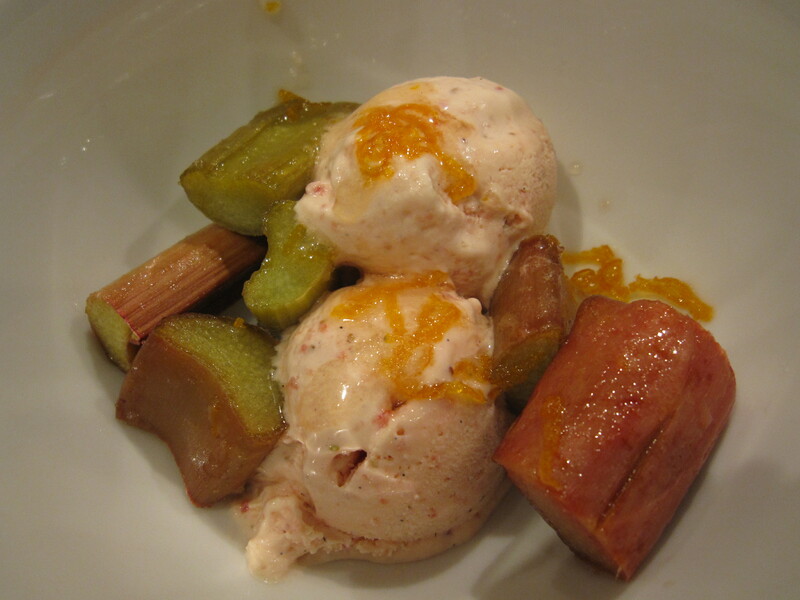 I have always loved rhubarb so we really enjoyed this recipe….sorry you did not like this dish but kudos for trying the recipe! Lovely photos! Sorry you didn’t enjoy the recipe, but it’s great that you tried it anyway. I’m jealous of your homemade strawberry ice cream. YUM. I’m actually starting to wonder if I simply needed to let the rhubarb sit in the oven longer, since mine looks decidedly less cooked than some of the others’. Maybe it’s not that I don’t like rhubarb, it’s simply that I don’t know how to cook it properly! I saw you mention that you didn’t have much juices in a comment on another blog and thought that maybe your rhubarb was just older like mine was, but I suppose its possible that you didn’t cook it long enough? In any case I am sorry that you didn’t enjoy it. Very possible, I now recall that the guy at my market told me that rhubarb is almost out of season here. The trouble is, since I never cook with rhubarb, I have no idea what to look for to ensure that it is fresh. I guess I’ll chalk this one up to a lesson learned and maybe give it a try again next year earlier in the season. I liked mine, though I did the opposite and forgot about it in the oven so cooked a little long. Good for you to try it again. Strawberry ice cream would be perfect! I wouldn’t know what good rhubarb looks like, but agree with your comment on revisiting childhood ‘dislikes’. I too have learned to love Brussels sprouts well into my twenties! I hope you get a chance to try the recipe again when the rhubarb peaks. Yours looked just like mine and I think if Nana was at your house she would have told you to chuck yours as well 🙂 Please know that I am teasing ! Seriously, yours did look just like mine – coloring wise. It seems amazing to me that something could be wrong with our rhubarb without it “looking bad” if you know what I mean. But I don’t know why mine ended up so different from others. I can say that a few I have seen have really red pieces, while mine was much more to the celery side. Stringyness and all. Nana hit no less than 5 stores today trying to find more (said “teenager” is coming back today 🙂 but no luck. We are definitely going to try this one again and I will be sure to report back. Well, I hope you don’t mind me saying that I am happy to hear that I was not the only one. Isn’t that annoying, to be all set with a recipe and then have the ingredients not work. I honestly wish I had Nana around to tell me that there was a problem instead of me just assuming that I didn’t like it. Will be interested to see how your rematch goes. Any sorry for the delayed posting, somehow wordpress decided to categorize your comment as spam and I only checked that folder today. Who knows! Nice post and you are a trooper to try something that you have not enjoyed in the past…just to give it a chance. There is so much good food to choose from that it’s OK not to like everything…like lima beans…no matter how many time I try them and even if mixed with lots of other good things, lima beans are gag bad! Agreed, but I still would have been happier if my recipe had turned out the way it should have. That’s too bad it didn’t work for you. I think it looks like it needed longer in the oven. Give rhubarb another chance next year! Sorry this one didn’t work out for you, but I think it’s great you were open-minded enough to try something you didn’t like in the past. That’s what I really like about this group, it really does give us an avenue to push through a lot of resistance we have towards certain things! I had no idea I had so much resistance to so much stuff!!! Most of the time it works out well, and every now and then it just confirms that there was a good reason we avoided something!